A couple of days ago I was poking around in the wine cellar and pulled an assortment of wines that made for a very interesting comparison tasting. Loosely organized around a Rhône blend theme, it included a pair of wines from California, one from Oregon and the fourth from the actual Rhône. I left Washington out because, well, just because. Sometimes even I need a break from Washington. All four circled around a $30 price point – expensive enough to ramp up the quality expectations, but neither rare nor over the top price-wise. What was I looking for? Quality, first and foremost. Regional typicity next. Some marks of distinction. And maybe a surprise or two. I found all of the above. California was represented by a 2004 Syrah from Michaud Vineyard, a small, family-owned and operated vineyard and winery in the Chalone AVA of Monterey County. It’s 13 miles east of Soledad, as the crow flies, and sits at 1600 feet – high desert, with temperature swings that can drop 60 degrees overnight. Though most of the production here is chardonnay and pinot noir, some marsanne and syrah is also made. (The pinot blanc, the winemaker notes, was entirely consumed by wild pigs for several years running). Also in the mix was a 2006 Estate Cuvée from Clayhouse, a Middleton Family winery east of Paso Robles (Washington’s Cadaretta is part of the same portfolio). From Oregon came a Francis Tannahill 200 Rogue Valley Grenache, finished at a California-like 15.4% alcohol. And from France, the 2007 Philippe & Vincent Jaboulet Crozes-Hermitage, a pure syrah, finished at 13% alcohol. All four wines were still drinking well after being open for 48 hours, always a good sign. They each had an immediate flavor-print that set them apart. The Michaud displayed the high altitude, limestone-inflected minerality of the region, and listed the alcohol at just 14%. The oldest wine by vintage, it was still sleek and compact, with plenty of life ahead. The Clayhouse was listed at 14.5% alcohol. It was a blend of 29% grenache, 26% mourvèdre, 26% syrah and 19% petite sirah. The petite sirah made it an outlier, in my view, and coarsened rather than amplified the tannins. I’d have left it out. But otherwise a fine effort. The Tannahill, oddly enough, was the most alcoholic of the flight. Thick and jammy, with very ripe flavors of berry, it surprised me with its power and concentration. But it was the Jaboulet that I drank, rather than tasted. Its distinctive flavors included some lovely citrus and floral highlights. But most of all, it was the wine I could fill my glass with, again and again, without feeling the effects. It’s not new information to suggest that keeping alcohol levels in check is truly the last great challenge for American winemakers. But isn’t it so? Despite the occasional debate (my terrior is better than your terrior neener neener neener), there is plenty of ‘terrior’ to go around in this country. Winemaking is generally polished, and the technology top notch. 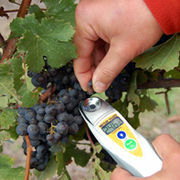 As Michaud proves, certain sites can ripen grapes at moderate sugar levels. It has nothing to do with which state the vineyard happens to occupy; it has everything to do with the specifics of the actual location. As the grapes roll in for 2010, the word from up and down the coast is that phenolics ripeness has been achieved at lower brix. All credit to Mother Nature for that. Now, how can we make it happen with predictable regularity? "Despite the occasional debate (my terrior is better than your terrior neener neener neener), there is plenty of ‘terrior’ to go around in this country". How was the 200 holding up? I don't have vintage notes on that year, but I suspect it was pretty New Testament. OOPS! Let's make that a 2008.